India’s prodigious economic growth refuses to let up. While the 2008-09 world financial crisis caused a brief interruption (GDP growth dipped from pre-crisis averages of 9% to less than 7%), it quickly rebounded and now approaches double-digit levels again. This economic expansion, coupled with India’s billion-plus population, has triggered soaring energy demand. By 2030, India is expected to become the world’s third-largest energy consumer. Predictably, projections forecast the need for dramatic increases in energy generation in the coming decades. New Delhi’s Planning Commission estimates that to maintain 8% GDP growth through 2031-32, India’s primary energy supply must be tripled and electricity generation quintupled. Accordingly, India places a premium on its ability to obtain energy assets abroad. To this end, in September 2007 the External Affairs Ministry established an energy security division to coordinate global energy diplomacy efforts (with the goal of concluding energy-related MOUs and bilateral agreements). Today India’s energy diplomacy, while modest in comparison to China’s, extends across Central Asia, the Middle East, Africa, and Latin America. Diplomatic campaigns smooth the way for the international activities of India’s national oil and gas companies (NOGCs), which expend billions of dollars on dozens of assets in about 20 nations. India’s externally oriented energy security strategy holds troubling implications for national security. First, with many of its prized energy assets (and the sea-lanes needed to convey them back home) situated in volatile regions, Indian nationals – from overseas-based NOGC staff to seamen transporting energy supplies – operate under dangerous conditions. The Middle East – convulsed by uprisings and violence in 2011 – houses Indian hydrocarbon blocks from Egypt and Iran to Syria and Yemen. Indian energy trade must navigate the piracy-choked coast of Somalia. And war in Afghanistan and perennial unrest in Pakistan will pose security risks for Indians involved with the envisioned Trans-Afghanistan (TAPI) pipeline, which, if ever constructed, will pass through both of those nations. 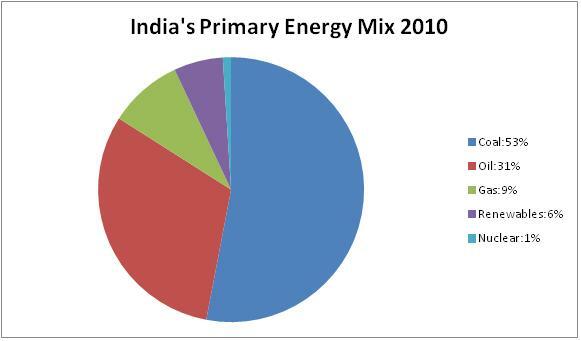 Second, India’s race for overseas energy resources brings it into close competition with China. The latter, which is already embroiled in a border conflict with India, often angers New Delhi with its aggressive efforts to acquire oil and gas reserves in and around the Indian Ocean Region (IOR), which India regards as its backyard. Some Indians believe that such activities constitute part of a Chinese “string of pearls” strategy, meant to encircle India from East Africa to Burma and the Bay of Bengal. India makes little secret of the fact that its current military modernization is driven by a desire to accelerate efforts to keep up with China’s own modernizing trend. Critically, even the more modest internally oriented elements of India’s energy security policies endanger national security. For instance, India is blessed with ample hydropower resources in Kashmir. With economic growth and energy demand soaring, the nation has increased its development of hydro dams along the western rivers of the Indus Basin. This policy enhances energy security but adds to tensions with neighboring Pakistan, where the anti-India militant group Lashkar-e-Taiba (LeT) routinely accuses India of “water theft” and threatens to retaliate with violence. Additionally, one of the rallying cries of the summer 2010 uprising in Jammu and Kashmir revolved around the perception that India’s state-owned hydro companies were not allocating sufficient electricity to energy-starved locals. Meanwhile, sizable quantities of India’s coal reserves are located in the central and eastern portions of the country that serve as the bastions of a virulent Maoist insurgency. This has implications for both access and security. On the one hand, it is difficult to extract these reserves. On the other hand, when coal is excavated from these areas, locals are often displaced and living conditions become toxic. In so doing, New Delhi and the nation’s powerful mining corporations fan the flames of the insurgency, which India’s top leadership repeatedly describes as the country’s gravest internal security threat. The great significance of political instability in India’s coal-rich areas cannot be emphasized enough. Coal constitutes the majority resource in India’s energy mix (53%), and about 70% of the country’s electricity generation occurs in coal-fired power plants. In India, no indigenous energy resource occurs in greater supply than coal (in fact, only two countries produce more coal than India does). If access to coal is jeopardized in India, the country’s energy security is immediately imperiled. With India’s energy needs increasing exponentially, and with the volatile regions housing its energy assets – from Maoist-infested Chhattisgarh to strife-torn Libya – demonstrating few signs of stabilizing, implications for India’s national security will grow more serious. It is increasingly apparent that India’s policymakers and strategists must take account of energy security issues as they craft national security policies. How, then, can this be done? To be sure, India’s government and military have demonstrated an understanding of how energy needs are tied to national security. Back in 2009, Shekhar Dutt, the country’s deputy national security adviser, described energy shortages as a future threat. Addressing this challenge constitutes “part of a broad national security plan,” he stated, of which defense is only one part. The navy, more so than any other branch of India’s armed forces, recognizes the links between energy and national security. The official Maritime Doctrine states that disruption of India’s Persian Gulf-based oil supplies “could critically affect the country’s interests,” and that offshore oil and gas facilities are “extremely vulnerable to disruptive attacks.” The document lays out strategies for enhancing what the navy describes as “security of energy,” or the military means to address energy supply vulnerabilities. These include investments in maritime capacities to protect littoral-area energy infrastructure, and better protection of energy-assets. Accordingly, India places a premium on its ability to obtain energy assets abroad. To this end, in September 2007 the External Affairs Ministry established an energy security division to coordinate global energy diplomacy efforts (with the goal of concluding energy-related MOUs and bilateral agreements). Today India’s energy diplomacy, while modest in comparison to China’s, extends across Central Asia, the Middle East, Africa, and Latin America. Diplomatic campaigns smooth the way for the international activities of India’s national oil and gas companies (NOGCs), which expend billions of dollars on dozens of assets in about 20 nations. Such developments are welcome, yet insufficient. Consider that even as India’s navy seeks to boost its power projection capacities (it plans to add 100 new warships over the next decade), it still lags far behind China’s forces, which have three times the number of combat vessels and five times the personnel. India also lags behind China in the overseas energy acquisitions race (this is due in part to non-military factors such as China’s longer time spent in the acquisitions business and to the onerous Indian government regulation of energy diplomacy and deal-making). Delhi’s unease about Beijing’s IOR-based energy activities is deepened whenever it is outbid as was recently the case with a natural gas deal with Burma. Complicating matters further is India’s notoriously inefficient defense procurement and modernization process, which is at best bureaucratic and at worst corrupt. Another, more fundamental, challenge to India’s efforts to enshrine energy security imperatives in national security planning is what some describe as a lack of strategic thought. Arun Prakash, a former Naval Chief of Staff, has written that Indian politicians and statesmen simply do not demonstrate a commitment to long-term planning and strategic foresight. “Every military operation since independence,” he notes, “has been guided more by political rhetoric than strategic direction.” One indication of this lack of strategic thinking is the fact that India’s navy – despite its self-defined prime role in protecting energy assets – has traditionally been the least well-resourced of the three military branches, a consequence of what US Naval War College professor Andrew Winner labels India’s “sea blindness.” While naval budgets have increased each year for much of the last decade, the same is true for the army and air force. The difficulties in furthering the integration of energy concerns into security planning are thrown into sharp relief by a study published by Booz Allen Hamilton (BAH) in 2007 [“Energy Futures in Asia: Perspectives on India’s Energy Security Strategy and Policies,” Prepared by Bethany A. Danyluk, Juli A. MacDonald, and Ryan Tuggle, Prepared for Director, Net Assessment, Office of the Secretary of Defense]. The report depicts Indian military officers as very wary about involving themselves in energy matters. The armed forces surveyed for the report assert that energy matters are essentially a commercial issue. They refuse to commit to interventions if Indian energy assets abroad are imperiled, contending that the nations hosting these assets are expected to provide security. Military officers demonstrate little concern about energy insecurity sparking conflict (with the exception of some scenarios involving India-China competition), and argue that in past conflicts with Pakistan, energy supplies were never disrupted – intimating, falsely, that such disruptions remain unlikely in the present day. The BAH report acknowledges that such views are beginning to evolve, with some in the military (particularly in the navy and air force) speaking of the need to create more strategic reach and power projection. Such doctrinal evolutions, it concludes, will facilitate India’s “ability and willingness” to carry out energy security-related operations. In the few years since the report was released, India’s energy-linked security vulnerabilities have been sharply exposed. The LeT’s sea-based assault on Mumbai in 2008 demonstrates the ability of militants to penetrate India’s shores – and hence its offshore energy infrastructure. Rumors in the spring of 2011 about militants’ infiltration of the Pakistani navy will only deepen the perception that India’s shores are vulnerable to attack. Meanwhile, the worsening Maoist insurgency – the nearly 1200 casualties last year represent the most killed in any year since the rebellion began in the 1960s – reveals the constraints India faces in exploiting its most heavily consumed indigenous energy resource. According to media reports, Maoist violence now afflicts 40% of India’s top-50 mineral-rich districts. The time is ripe to shift from mouthing platitudes about energy-national security links to implementing actual policies that solidify this nexus. What are some possible steps toward consummating this shift? The government and military will struggle to incorporate energy issues into national security planning so long as energy policies remain as poorly coordinated as they are today. India does not have an overarching energy ministry, and as a result a number of different ministries (Petroleum and Natural Gas, Coal, Power, Renewable Energy, and External Affairs) perform redundant energy-related duties. One improvement would be to reduce duplication between the MEA’s energy security division and the Petroleum and Natural Gas Ministry’s international cooperation division (according to Indian energy specialist Shebonti Ray Dadwal, the latter cell even has a senior MEA officer posted to it). With India’s military not presently in a position to secure the nation’s far-flung energy assets, New Delhi must also better coordinate security-related arrangements with the nations housing these assets. Specifically, Indian energy firms and the government should elicit guarantees from host nations that plans are in place to protect both the holdings and the Indian personnel managing them. While the armed forces have generally expressed satisfaction with the security provided by the, the unrest unfolding in the Middle East over the last few months – home to about two-thirds of India’s oil imports – starkly illustrates the need to revisit and reexamine the security plans of any existing arrangements. India needs to enlarge the navy’s resources. As the nation enhances its power projection capacities to better enable it to protect its energy holdings (both offshore and overseas), the navy will remain on the front lines. The navy has been pushing the army and air force to expand their conception of security from one of sub continental conflict to one of global conflict (a broader framework that encompasses energy security), and these two branches readily acknowledge that they view the navy as an agent of change. Furthermore, with the exception of indigenous coal reserves in Maoist bastions, India’s energy security threats are largely sea-based. India’s sea-based energy assets have increased significantly in recent years, and while much of this expansion has occurred abroad (thanks to India’s decision to geographically diversify its source of supplies), it is also happening closer to home. The country has constructed over 3,000 kilometers of pipeline to facilitate the flow of oil and gas from offshore platforms to onshore terminals. Additionally, to facilitate increasing crude imports, India seeks to become a refining hub, and refining capacity has already tripled since 1998. While it is unrealistic that the naval budget will leap ahead that of the air force, much less of the army, it is undeniable that the navy needs more resources to ensure the security of the country’s growing array of sea-based energy assets. India should also boost the capacities of its strategic reserves for civilian use in the event of war or other supply interruptions (India’s military has a separate reserve to meet war-fighting needs). According to Dadwal, India’s strategic reserves are expected to have, at most, a capacity of 15 metric tons – insufficient for energy security. The Financial Times calculates that this reserve, expected to be operational by the end of 2012, will be able to hold little more than two weeks’ worth of imports. India’s Integrated Energy Policy, a government assessment released in 2006 (and not updated since then), argues that because “today’s local wars are not likely to last beyond a few weeks,” buffer stocks need not be large. Such an observation, however, ignores the fact that most of today’s conflicts are driven by non-state actors and exemplified by long, grinding insurgencies or episodic periods of violence. Reserves must be equipped to weather the long, drawn-out conflicts that imperil international security (and particularly the Subcontinent) today. While one cannot expect India to strive for the whopping 100 days’ worth of imports envisioned by China’s strategic reserve, it should aim for a reserve capacity approaching three months (a level maintained by many nations). Above all, India’s national security planning must make more robust efforts toward regional peace. The connection between peace and security may be clear; less so is the link between peace and energy. In essence, stability and strong ties with its neighbors can dramatically enhance India’s energy security. An obvious example, albeit one that extends beyond regional matters, is relations with the United States. For much of the Cold War, US-India relations were poor. However, in the post-Cold War era, the bilateral relationship strengthened to the point that the two governments were able to conclude a landmark civil nuclear agreement. The US Energy Information Agency projects that with the new inflow of nuclear energy and technology into India, the nation’s nuclear power generation will increase at an average annual rate of nearly 10% until 2035. 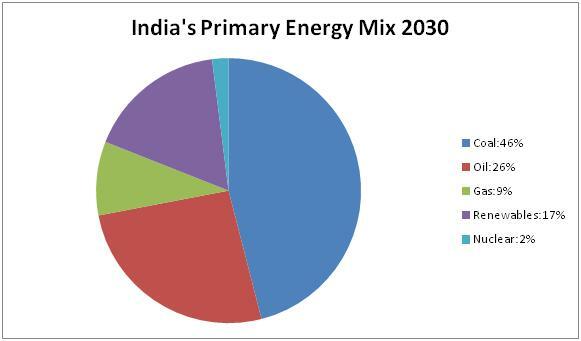 To be sure, however, even with such a ramp-up in generation, nuclear energy will remain a relatively modest component of India’s energy mix; it is projected to account for small percentages of India’s energy supply even in 2030 (anywhere from 2% to 6%, depending on the estimate). Closer to home, warmer regional ties would enable forward movement on pipelines, a critical means of delivering natural gas resources to India without fear of sea-based threats. Granted, some areas envisioned as part of pipeline projects (such as the eastern portions of Afghanistan figuring in the TAPI pipeline) are convulsed by endemically driven instability that would not magically disappear if peace were to break out across South Asia. Yet India-Pakistan rapprochement, for example, would remove one of the major impediments to constructing the TAPI. Perhaps most beneficial to India’s energy security would be improved ties with Beijing (a goal that, despite vocal opposition from hardliners and hawks in the Indian security establishment, is fervently pursued by New Delhi’s civilian leadership). With more cordial Sino-Indian ties, China’s forays into the Indian Ocean Region would likely be more freely accepted in India as a natural outgrowth of China’s immense economic and energy needs. India could then proceed with its own energy-oriented activities in the IOR (and, by extension, in Southeast Asia) without fear of provoking Beijing’s anger. In other words, instead of responding to a Chinese “string of pearls” strategy with a retaliatory “string of diamonds” effort (rhetoric used in today’s highly charged debates about Sino-Indian energy competition), India would simply carry out its own energy diplomacy alongside that of China. Most critically, such energy cooperation would boost opportunities to bid jointly for contracts abroad. India has actually teamed up with China on certain occasions previously, though such arrangements have been rare more recently. Joint bids would be a particular boon for India, given that the nation so often loses out to its Chinese competitor. Better inter-agency and international coordination, enhanced naval and reserves capacity, and greater efforts toward regional peace can all bring positive outcomes for both energy and national security. Admittedly, however, they do little to lessen India’s dependence on overseas hydrocarbons – an addiction that fuels the very insecurity these three recommendations are meant to reduce. Therefore, New Delhi’s official policy of energy resource diversification –particularly in terms of focusing on a broader array of indigenous supplies – is a welcome one. In the last few years, 15 trillion cubic feet of natural gas deposits have been discovered in the Bay of Bengal off Andhra Pradesh state, and ample oil reserves unearthed in the state of Rajasthan. Such finds have prompted the Indian energy giant Reliance to promise that it will increase indigenous oil and gas output by 40%. Indeed, while gas currently constitutes only 9% of India’s primary energy mix, Reliance has taken major steps to ensure that the fruits of the Bay of Bengal discovery are exploited to the fullest. Soon after the gas deposits were found, the firm built a pipeline of nearly 50 diameters, with production capacity of nearly 3 billion cubic feet per day. This should prove advantageous for India’s energy security, given that natural gas consumption in India has risen faster than any other fuel in recent years (demand has grown at a 6.5% rate over the last decade). Additionally, the power generation, fertilizer, and petrochemical production industries are all moving toward natural gas. The gas discovery may prove to be more of a boon for energy security than the oil one. Even with the oil found in Rajasthan, India houses less than 0.5% of the world’s proven reserves of crude oil. Not surprisingly, a significant majority of India’s oil consumption (two-thirds) originates from abroad. 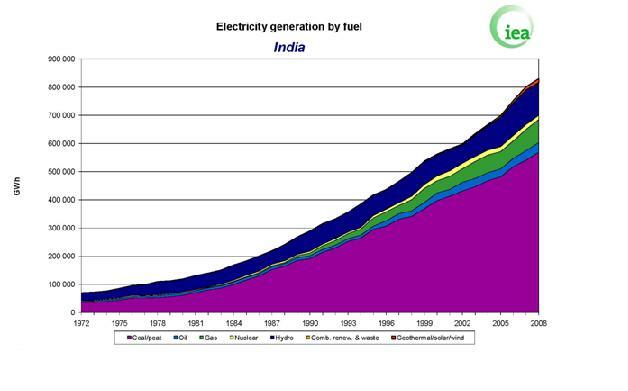 Furthermore, oil constitutes a relatively small portion of electricity generation in India (see chart below). Meanwhile, efforts to exploit local renewable electricity sources are coming along well. Increases in solar and wind power investment have averaged 10% per year, while India’s wind power program is already the world’s fifth largest. Wind now constitutes about 14,000 MW of electricity capacity, with solar now expected to approach 20,000 MW by 2020. Together, they represent a modest share of India’s total electricity capacity (presently about 173,000 MW), yet represent a considerable increase from years past. However, despite such achievements, the sheer volume of India’s energy demand ensures that the nation will remain dependent on overseas energy into the foreseeable future. To blunt the impact of supply shocks on energy security and national security, India should promote better energy demand-side management. In other words, India should respond to energy demand by managing existing resources more judiciously – and not simply by generating new supply. There are some hopeful signs on this front. The government has already announced its intent to root out electricity theft and poor energy billing practices – problems that the government’s Planning Commission estimates cost distribution companies more than $6 billion per year. The government also needs to take more decisive action against energy wastage; this can be done with more robust regimes of energy infrastructure maintenance that minimize the possibility of leakage and other inefficiencies. However, from a national security standpoint (and particularly from the vantage of internal security), energy equity measures are important as well – and sorely lacking today. Some of India’s top security threats emerge from grievances about unjust exploitation of local energy resources. The Maoists, for example, seize on the sentiments of locals unhappy about how local coal reserves are mined by outsiders and promptly trucked away. And in J&K, locals resent how hydro firms tied to New Delhi take away their electricity. The government and private energy firms alike must ensure that local (and often impoverished) communities are guaranteed a proper supply of energy. To this end, last year Indian legislators attempted in vain to pass a bill that would have allocated 26% of mining company profits to local populations. This unsuccessful attempt to promote greater energy resource equity must not dissuade policymakers from undertaking similar efforts in the future. More equitable energy use can help calm volatile populations and weaken insurgencies, thereby strengthening national security. This goes to show that bringing energy issues into the national security fold is not only a matter of enhancing the navy’s capacities to protect offshore energy holdings, or of promoting peace with neighbors to yield more energy cooperation. It is also a basic matter of governance: ensuring that those in need of energy resources are provided with them, in order to head off any unrest and violence that could ensue if such resources remain elusive.